Pureswiss is an exclusive brand of Metro Gaisano. Our products include 70% isopropyl and ethyl alcohol, 40% isopropyl and ethyl alcohol, hand sanitizer, mosquito repellent lotion, petroleum jelly and cebo de macho. 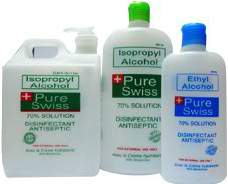 With constant innovation and product development, new Pureswiss products are introduced all the time to provide all your disinfectant and cosmetic needs. Drop by any Metro Gaisano to check out the wide variety of Pureswiss products!